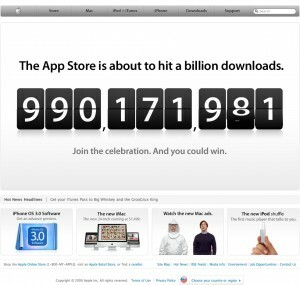 Countdown to Ecstasy: Apple prepares the confetti and balloons for its big Billionth By Gadjo Cardenas Sevilla You can always tell a new Apple iPhone owner from the glassy-eyed excitement they have as they share and compare the applications they have downloaded and tried. The first few days with an iPhone are usually spent downloading any app that is cheap and interesting. This downloading behaviour usually tapers off as users settle into the apps they most use. Part of the iPhone's appeal is its ability to morph into any of thousands of devices and deliver a whole new way to do things within the interface. It is also the availability of inexpensive applications and while a lot of them are rubbish, there are some very useful apps that have helped cement this success. The iPhone is a serious product that has not only built a steady market share, it has grown a blossoming ecosystem of third party accessories, cases and peripherals and developed a bona-fide mobile computing platform for itself that has thrived despite the shortcomings of the operating system. The inability to multitask, the lack of cut-copy and paste as well as the limits of the touch interface have not at all diminished the iPhone's appeal or usefulness. Now that these shortcomings are to be addressed by a major software upgrade come June 2009, there will be little in the way of the iPhone reaching its full potential. The new OS brings a whole spectrum of new features and the ability to work directly with third-party hardware as well as greater freedom for developers to create killer apps. Developers, Developers, Developers The Apple iPhone has really helped bring developers into the Apple fold. Developers, who in the past may have shunned away from Apple's desktop OS, have embraced and profited from creating smart, small and exciting programs for the iPhone. Prior to the release of the iPhone OS SDK, people were Jailbreaking the iPhone like crazy just to get more out of it and run illicit applications because they could see the potential. Back then, the only legally sanctioned iPhone apps were limited to web applications which relied on the built-in Safari browser. This changed dramatically with the availability of the iTunes App store and enabling users to purchase new applications on the fly. Apple's App-specific TV ad spots brought the mobile platform to the mainstream, an unprecedented move. Never has a mobile computing platform focused on specific applications. Now there is a higher global demand for iPhone developers than there is for Facebook developers. iPhonefootprint Blog explains how this growth has recently boomed. "The trend at the international job site oDesk shows that the demand for iPhone application programming has jumped by a whopping 500% in a period between March 2008 and September 2008. The listing has increased from 30 to over 140 and the jobs span around various aspects emerging from the twin platform of iPhone (and iPod touch) and the App Store. Another trend shown by this site is that this demand is not only USA specific. The oDesk list shows a stiff demand for iPhone programmers and consultants across the globe, including India, Russia, China, Ukraine and a number of other countries. The types of jobs range from iPhone App developers to iPhone SDK engineers and various other iPhone programming and consulting jobs" The App store makes spending easy Apple's success at cultivating developers for its mobile platform has allowed them to focus primarily on what the hardware can do and let the community provide the programs. Aside from the initial bundled iPhone applications and the Remote app (which can control Macs via Wi-Fi or Bluetooth), Apple really hasn't created any new apps itself. As amazing as one billion downloaded app sounds, and it is quite an achievement on any computing platform, mobile or desktop, things can only get better once iPhone 3.0 rolls out midyear. Expect more flexibility, better application selection and more money going Apple's way. By Gadjo Cardenas Sevilla Pierre Martell: Bridging home building and high technology for the benefit of customers "I think our clients like that we are only a "click" away, and they are always in the know of what is happening with Martell Homes, I believe this provides a sense of comfort that we are not a fly-by-night company, we are here to stay and if they need anything they know exactly where to find us," says Pierre Martell, co-founder of Martell Home Builders from Moncton, New Brunswick, whose high tech approach to home building has made successful use of today's social media tools. By involving their customers in each aspect of home building, Martell Home Builders manages expectations and communications by keeping them in the loop. "We all have, iPhones and Macbooks, use Twitter, Facebook and use 37 Signals for our CRM, SmugMug for online photo sharing, Smugshots for mobile photo uploads (this actually geotags the photos) gotVmail for our toll free number and online messaging, Skype and Tokbox for video conferencing, Google for calendar and document sharing and GMail for email," Martell explains. The integration of all this technology with a client-oriented approach has enabled Martell Home Builders to grow their business and deliver on their promises. A rare thing in the contractor and home builder industry where delays, budget bloat and communication problems are common occurrences. "We have completed 42 homes, currently we have 8 in the works that construction has begun on or will begin soon," Martell declares. He explains that client management has been a big factor for success but aside from offering high-tech monitoring options he also credits building close relationships with each client as a key for their success. "Pierre treated us like we were his friends and we felt very comfortable approaching him with any questions or requests that we had throughout the home building and buying process," explains Lisa Rice, a satisfied customer. Customer satisfaction comes, in part, from the company's 99-day countdown system. "For homes under 2000 square feet, we give our personal guarantee that once construction begins on your new home, you will be in it within 99 days, we have not missed a closing date yet," Martell explains. Another advantage developed by Martell Home Builders is enabling customization and interactive design tools for the clients to use in their home building process. "I think both aspects of our model (customization and interactive approach) appeal to our customers, the fact that they are in control over the build of their home where they make decisions, have choices and feel they are being heard and really be a pivotal part of the whole process," Martell explains. The company foresees growth and is expanding to the Saint John and Fredericton markets for 2009. The most challenging part of their business, according to Martell, is "ensuring the MHB team meets all our own deadlines and expectations." On the flipside, the company finds that the most satisfying part of their business is, "definitely closing day, when we hand over the keys to the new homeowners, seeing their excitement first hand makes every bit of hard work absolutely worth it." In this economic downturn, Martell has some advice for would be homebuyers. "With the interest rates as low as they are, I would encourage would-be homebuyers to hop on the homeowner bandwagon, but keep within their means, your first home doesn't have to be a mansion, it's best to start with what you need based on age, income, family size." Articulating screens- Coming soon to a DSLR near youWe're seeing an interesting wave of consumer-oriented DSLR cameras coming to market in the next few months. The focus is on lower prices and consumer oriented features including articulating LCD screens, high-definitiion video capabilities, improved sensors and lens selection as well as smaller and lighter bodies. New Nikon on the Horizon The new midrange-consumer model for Nikon will be the Nikon D5000, a 12 Megapixel DSLR with video recording capabilities, an articulating LCD screen as well as 4 frames per second continous shooting and 11-focus-points. The D5000 seems to be placed between the D60 entry-level 10 Megapixel model and the D90 12 Megapixel model. It doesn't have the in-body stabilization of the D90 nor will it be able to record in full 1080p HD resolution but it should be able to manage video recording at a halfway decent 720p resolution. This is, essentially, a D90 squeezed into a D60's body. The D5000 will cost $730 body-only, or $850 bundled with the ƒ3.5-5.6G 18-55mm VR lens, and be in shops later this month. Olympus flexing muscles Not as revolutionary as the Nikon D5000, Olympus is set to launch an equally interesting DSLR in the e620. With 12 Megapixels, a tilt and swive screen, in-body image stabilization, live view as well as art filter that offers in-camera effects for photos. Banking on the Four Thirds system of lenses and accessories, Olympus sees the e620 as its midrange model that boasts of fast 7-point auto-focus and its tiny size that will make it one of the most portable, full-featured DSLR cameras in the market. 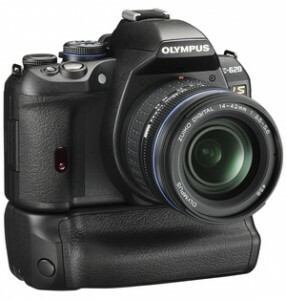 The Olympus e620 will be selling in Canada for $900 with a 14-42MM lens and should attract a lot of amateurs and prosumers who are willing to invest into the Olympus system. It should be an interesting time in the prosumer DSLR market , while megapixel sensor sizes are steadying at the 10-12MP range, we see features, usability and compact size as the competitive areas. [caption id="attachment_389" align="aligncenter" width="320" caption="Clever workarounds have enabled the \"Skype\" and \"Rogers\" logos to coexist on the same page"] [/caption] By Gadjo Cardenas Sevilla When word got around that Skype would be offering its VoIP (Voice Over Internet Protocol) application to iPhone and later on BlackBerry users were ecstatic. 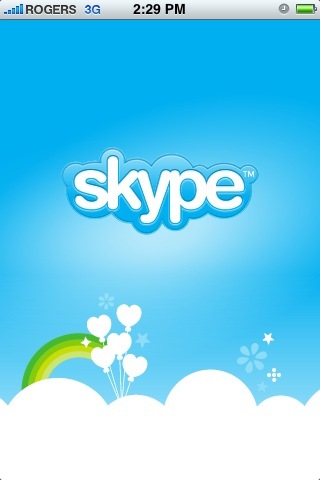 Skype is a well integrated product which is mature, has gone through all the kinks and simply works well. 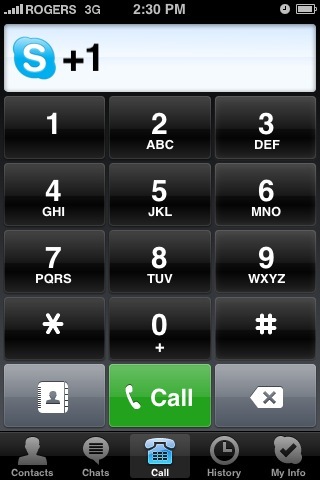 A lot of people already use it for voice chat, for video chat and even as an instant messaging client. A lot of people already have existing Skype credits on their accounts. When the news broke that Canada was not getting iPhone Skype because of "patent-licensing" issues, users quickly found a workaround to download the app from foreign Apple app stores. More on Skype after the break. Consumers, it seems, will always find a way to circumvent a situation and get what they want. When iPhone version 1 came out, you could see numerous unlocked and jailbroken models in the streets of Toronto just weeks after the first unlocking applications hit the Internet, same thing with Skype. Canadian iPhone and BlackBerry users totally fit the demographic of Skype-savvy individuals who are likely not to replace their phone contracts but supplement them with the Skype service. This is such a useful service, specially when traveling since you can pop-in to any Wi-Fi connection and make reasonably clear voice calls for way less than what you would on roaming charges. Using the iPhone or BlackBerry you already own is a great bonus. Cripple the Device You can currently only enable the Skype voice feature using a Wi-Fi connection. You can't use the 3G data connection to make your calls (although it is expected that the new revision of the iPhone's OS, 3.0, will allow this). Last week, when the Skype application suddenly emerged from Apple's App store the buzz hit the Internet as users were marveling at being able to make Skype calls on their iPhones and iPod Touch devices. Canadian users were once more let down and excluded from being able to download the Skype application from the Canadian Apple Store. The biggest and most painful sidebar to this story was that Skype is available to every other country except Canada! What gives? Get Skype on your Rogers and Fido iPhone by following these instructions There's no doubt how popular the Skype App has been. According to a posting on the Skype website: "In under 36 hours after it first appeared, Skype for iPhone has hit the number one spot in the following countries, being the most downloaded free app in the App Store: Australia · Austria · Belgium · Brazil · Chile · China · Croatia · Czech Republic · Denmark · Finland · France · Germany · Greece · Hungary · Ireland · Israel · Italy · Japan · Kuwait · Luxembourg · Netherlands · New Zealand · Norway · Poland · Portugal · Qatar · Romania · Russia · Singapore · Slovakia · Slovenia · South Africa · Spain · Sri Lanka · Sweden · Switzerland · Taiwan · UAE · UK · USA." Left out Again This unfortunate and infuriating reality is just one in a series of high technology mishaps that has long affected the tech-smart Canadian consumers. It took well over a year for Rogers, the giant GSM telco monopoly, to offer the Apple iPhone and it did so with initially horrible data plans that seemed that they were dug up from 1992. Canadian users can only cast wistful glances across the border as Amazon's Kindle Book Reader, now on its second iteration and allegedly selling like hot cakes (although no sales figures are really ever released) is still unavailable for Canadians. I t's baffling, really. Amazon.ca, the online store, exists and Canadians have been buying physical books there for years, so why can't we buy that cool, overpriced slab of lit-tech? We think a lot of it has to do with the data plan and free wireless WhisperNet service that comes bundled with the Kindles. Each Kindle allows you to trawl the Internet for free, for life. The main purpose is to be able to buy electronic books and magazines on the fly but we think the idea of offering free data for any duration is what will never allow the Kindle to work in Canada. Of course, there is always the question of the books themselves and the Canadian electronic rights to these books but if they already sell the physical books in Canada, it shouldn't be that hard to sell the e-versions as well. Another sore spot for Canadian consumers is the inability to access is the video service Hulu.com which offers access to TV shows and movies streaming on the web via browsers. Most of the shows are available on network TV already but Hulu makes them available anytime for free while pushing advertising before letting users watch. Yes, there are workarounds to this as well but after a while it gets tiring for people to hack around a system to enjoy its benefits. That and the reality that as with most software, succeeding updates and upgrades can render your workarounds and your device useless. It would be interesting to find out what the real reasons are for the shackling of the Canadian iPhone Skype app and what these "patent-licensing" issues really are.